Broken bread and poured-out wine. I first heard of this phrase while reading Oswald Chambers’ My Utmost for His Highest. The Lord cannot work through prideful, self-willed Christians. We must be broken of self-will. 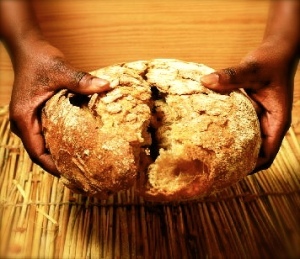 Before a man can eat a loaf of bread, he must break it (or slice it) first–especially if he is going to feed others. A broken and contrite heart, Oh, Lord, thou shalt not despise. The Holy Ghost flows much more freely through a broken vessel than a vessel that is all blocked-up because of self-will. Life is precious; blood is precious. The life is in the blood. Jesus is precious; His blood is absolutely precious. We should be about our Father’s business or go home and go back to bed. We must be about our Father’s business and quit chasing our selfish desires and then calling it Christianity. We who are born-again are vessels created for our Father’s service. When we obey Him, our lives are poured-out wine for others who are thirsting for something eternal and substantial. “Abide in me”: this could also mean, “obey me” or “remain under my covering”. Having knowledge in your head about the Gospel doesn’t cut it. Jesus didn’t die on the Cross so that we could become worthless aesthetes or hair-splitting theologians. He doesn’t want us to treat Him like an object of idolatry or an object of man-made religion. The Lord wants us to abide in Him, the True Vine, so that His Holy Sap will flow into us and sustain us, so we can grow stronger and bear much fruit. We do not abide in Him in thought (through dead reason); we abide in Him in revelation through faith. Faith is what moves mountains in the spiritual realm; faith is what keeps the sap flowing from the True Vine into the branches. When we act in faith, our lives are blessed and the Lord gives us fresh revelation. Do you want to live on the shores of the Dead Sea or do you want to live by a fresh, fast-moving, clear mountain stream? Abide in Christ everyday in faith, obey what He reveals to you and see how refreshed you are and how refreshing your life is to others. Reason by itself is idolatry; reason inspired by the Holy Ghost can only be beautiful. What good is an IQ of 200 if you are not born-again? What good are multiple college degrees and you reject Christ? What good is a forest of trees without rain or a field of wheat without irrigation? It will all wither and become chaff for the fire. I have heard more wisdom come out of the mouths of children who abide in Christ than from university professors who abide in nothing. “Abiding in” separates the men from the boys. “Abiding in” separates the living from the dead. There is living, “abiding in” fruit and there is fruit that lies on the ground, rotten and stinking. Did Jesus die on the Cross so that we could become a stench that rises up to Heaven or did He die so that we could die to self and be a sweet-smelling savour of life unto life. Our lives should be a sweet-smelling sacrifice unto the Lord. Genesis 4: 4: “and Abel brought of the firstlings of his flock and of their fat portions. And the Lord had regard for Abel and his offering.” Abel’s offering points towards the First-born-among-many: the Lamb of God, the Lord Jesus Christ. Amen Amen Amen! This is awesome and can only be written through a life that has been poured out. Blessings! Yes, I have also seen that phrase used by Chambers. I have also seen it used by Catholics like Henri Nouwen. So I’m wondering where the phrase originated? I know of no scripture that says it. Dan: I believe that phrase is referring to Jesus Christ’s life being poured out on the cross for the sin of the world; also our lives in Christ—taking up our cross and dying daily and obeying the Lord, so that the Holy Ghost can flow through us to a broken and sin-sick world.